That’s pretty tiny for a shop, Borrego. I only say that because I had one that size for a long time. 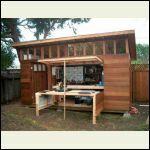 It can work, even if you have a table saw and maybe sliding miter or radial arm saw. If you have those, you’ll want doors on both ends, wide doors, for sheet stock and ripping lumber. Heck, I need doors on both ends for my (12 x 16) shop now. 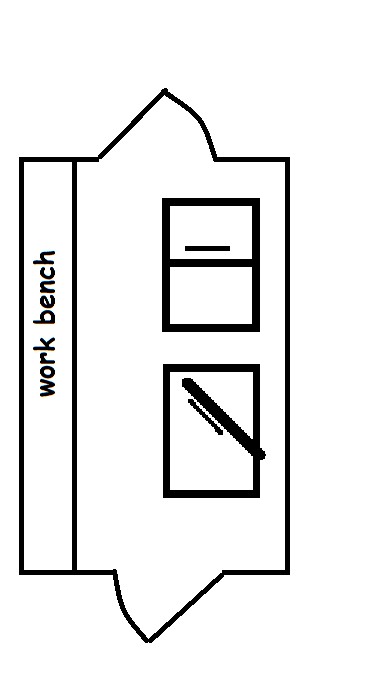 Anyway, you’ll want a work bench all the way down on one side and standing storage on the other. Ideal headroom would be at least eight feet from floor to rafter. And those rafters will need to have enough space above for storing lumber. So, the doors need to be high enough to slide that lumber in from outside. I suggest not using pegboard, and having walls stout enough for finish nails to hang hand tools where they’re handy. a 10 x 12 shop….. Always fun to see what you build, as for quite a few years now, you've showed your abilities and unique desert structures right here on SCF. Here’s a crude overhead drawing to clear up what I may have not conveyed via word. Of course nothing is to scale…probably. One of my favourite organizers is the Folger's Coffee containers... Nails, Screws etc can be organized and stored plus handy with the grab handle... Always have empty ones handy, boy they are useful for a lot of things ! I used to like those racks of 1000 little see thru plastic drawers. Until I tired of pulling 1000 little see thru drawers that I couldn’t actually see thru, to find who knows what by now. Holes drilled into studs for rebar or conduit to hang shovels and rakes upside down. Gets them off the floor. hahahaha... I thought that was just me..and then I would painstakingly make little labels for them figuring that would solve the problem..Not. That idea was from woodworking for storing wood. Ya know better yet, since studs are 16 OC, (might take modifying width since shovels are like 6-10 inches wide, how about hanging from the ceiling joists with eye hooks and coat hanger wire, two runs of 3/4 conduit spaced about 4-5 inches apart. Take the shovel, rake, etc. sideways between the bars, twist and they hang. Push then all back against the wall like a coat rack. Spread them out to remove one. So maybe one 8 foot 3/4 conduit cut in half. The coat hanger wire needs to be secured to the conduit very well. You could put conduit 90 degree connectors on the ends with 4 inch conduit between to make a rectangle that keeps its shape. 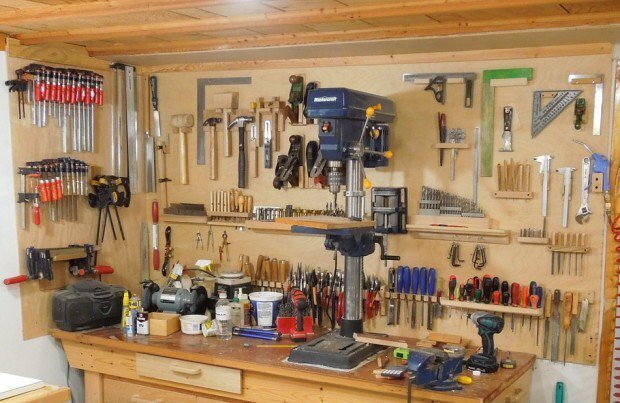 I'm not sure if you are on pintrest or not but there are some amazing ideas and projects on there for storage and tool organization. Might be worth a look. 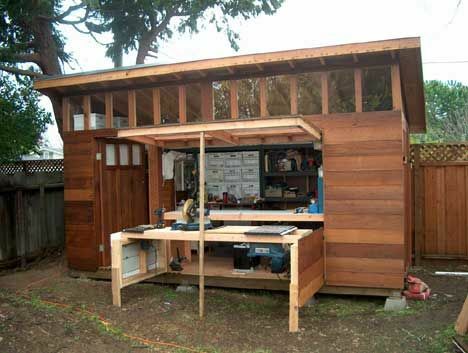 Thought I'd share what I find as I go along..
Just found this, pretty cool..
Maybe I'll do something like this, with an outdoor opening window/bench...to get more room and I love working outdoors anyway...? Oh yeah, great ideas there! When you run out of room on the bench and in drawers, attach storage jars to the ceiling or bottom of shelves by their screw on lids. Used to use coffee cans but after years am changing over to glass containers - much easier to see and grab as your vision slowly goes. Y’know, I inherited a rack of baby food jars with their lids screwed to boards. The ol’ guy, my step grandad, had carefully organized his shop, something to behold. Anyway, after putting all my screws, nuts, washers (flat, lock, star) and all the other tiny stuff I had, into those jars, I discovered screwing those lids back on were a bit tricky. Then I discovered picking up those screws, nuts, washers (flat, lock, star) and all the other tiny stuff off the floor was something I really wasn’t all that fond of. I poured everthing into coffee cans. When I need a certain screw or washer, I empty a coffee can onto a cookie sheet, or even the work bench, pick out what I want, and scrape everthing back into the coffee can. Whenever I end up with the odd stuff after a project, just toss it into the can. My Dad used cheezwiz jars screwed into the shelves but that was over 40 years ago and I cannot remember whether there was issues with the rescrewing of the jars - it would be hard to imagine that there weren't issues. I just have mine sitting on the shelf in glass unfastened.